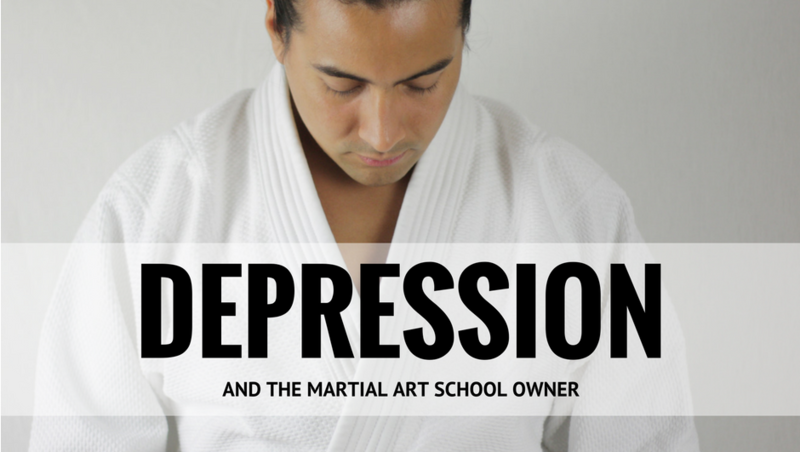 Okay, so let’s talk about depression and the martial art school owner. The first thing I’m going to say is that, if you are depressed, go see a mental health professional, either a therapist, counselor, or psychiatrist. The days of there being a stigma against seeing a therapist to talk through issues are long gone. So, if you need help, get help. Now, let’s talk about how depression can impact the school owner, and what you can do to prevent it from creeping up on you. Running a small business can feel like you have an 800-lb gorilla on your back. Sometimes that monkey is beating you up, and other days it’s just sitting there taking a free ride and making it hard to get through the day. And, running a martial art school can be a lonely job. It’s easy to start to feel isolated, because when you run a school your job is a lot like that of a pastor or priest. Everyone comes to you with their problems, and they expect you to listen and fix them. However, for school owners often there’s no one for them to go to with their own problems. So, you end up carrying your own weight, and everyone else’s as well. Your monkey + everyone else’s monkeys = you feeling like you’re carrying too much weight. No bueno. Not at all. The thing is though, that monkey is in your head. I’ve had times when things were going great financially, and times when I thought I was going to have to file bankruptcy (thank you, government officials and banking industry executives, for colluding to create a mortgage industry collapse). When you’re in business, it’s not a matter of IF things are going to go wrong, it’s WHEN. I’ve been self-employed for most of my adult life, and I can tell you that you’re always going to have challenges when running a business. And the difference between school owners who win the mental game and those who lose their mind every time they experience a minor calamity (which is going to be daily, for most school owners) is all in their perspective. Perspective is everything to an entrepreneur. Generally speaking, the school owners I work with who have a healthy perspective on life and business in general are much more likely to succeed than those who don’t. 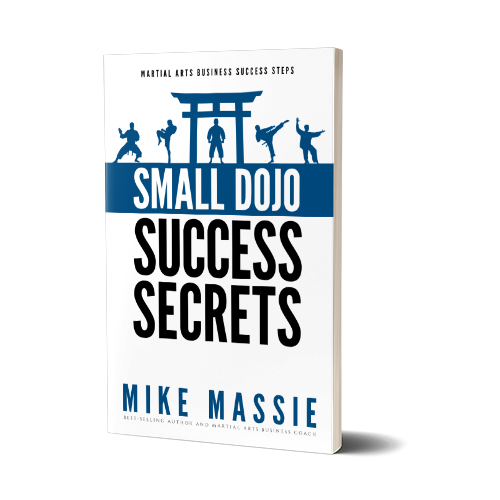 If I’m working with a school owner, and every time they turn around they’re talking about some new crisis that’s occurred, I know that person is going to struggle to grow their dojo. The reason has to do with something in your brain called the reticular activating system (RAS for short). It regulates sleep and wakefulness patterns. It modulates brain activity from low to high states of attention. The second function is the one we’re most concerned with for the purposes of this discussion. See, the RAS acts as a sort of early warning system to alert the brain to things it needs to pay attention to, for purposes of survival and wellness. However, the RAS will go on high alert based on whatever the brain is trained to be alerted to, based on past experience. It will also take direction from the conscious mind to trigger your attention based on whatever you are focused on at the time. A common example of how this works is the “red car” illustration. Say you’re shopping for cars online and you find a red sports car that you really like. Previously, you would never have noticed whether that car was present in your environment. But, because you now associate that color and model with feelings of contentment, pleasure, social acceptance, or other positive emotions, suddenly you begin noticing that model and color of car everywhere you go. This is the RAS activating to let your conscious brain know there is something it needs to pay attention to in the immediate environment. This is something I repeat constantly to my students when I am teaching small joint locks. The reason is because it’s difficult to put a small joint lock on someone when they are aware of what you’re doing; they’re going to fight it every time if that’s the case. But, distract them somehow and get their attention off what you’re doing, and suddenly the lock is easy to apply. In the same way, YOUR energy flows where your attention goes. When you are constantly thinking about and focusing on the “bad” things that are happening in your business, that’s ALL you’re going to see. And pretty soon, instead of seeing the positive things that are going on in your business, all you see is calamity and crisis. That is no way to win the mental game, or to be successful in your business. So in many ways, happiness is a choice. ** If you choose to focus on things that are going well in your life, chances are very good that you will be happy. Likewise, if you choose to focus on the “bad” things in your life, you will end up being miserable most all the time. Happy people practice gratitude, often and daily. They actively pursue thought patterns that recognize the “good” things in their life, and they express gratitude for those things, either in prayer, journaling (Lyubomirsky, Seligman), or daily reflection. Happy people are connected people. They cherish their personal relationships, and work hard to maintain their relationships with others. They have deep, rich connections with the people they love, express love to those people, and receive love in return. Happy people tend to be externally focused. In other words, they tend to be more focused on serving others and making other people happy, than they are on their own personal happiness or unhappiness. In other words, kind people tend to be happier people. So, if you want to be happier, practice gratitude daily, love more and allow yourself to receive love in return, and routinely practice acts of kindness to others. I can think of no better formula for improving the happiness of an individual. One final note… as it turns out, money won’t make you happy, but it helps. One 2010 study by Deaton and Kahneman showed that a household income of around $75,000 a year was the tipping point where a person’s income is able to relieve much of the daily psychological stresses of life. Incidentally, having more money doesn’t seem to increase this effect; also, $75,000 in 2010 is roughly the equivalent to $85,000 today. Ironically, for those of us who have experienced poverty or who are going through financial struggle, note that it is easier–MUCH easier–to achieve financial success if you are happy than if you are depressed and stressed all the time. In other words, happy people tend to be more successful than unhappy people. So, if you’re struggling financially, work on increasing your happiness level, and it will make it easier to increase your income so you can experience even more happiness. Allow me to share a personal story to illustrate this principle. About 18 months after starting my second school, I was both dealing with chronic pain issues and struggling financially due to the Great Recession. The mortgage fallout had quickly impacted our community (it was a transitional community with a lot of homes financed through high-risk mortgages). And, I had just expanded my school and tripled my overhead, right before everything went to pot. Soon it started taking a toll on my performance as an instructor and my interactions with my students. I was hurting so bad that I would teach class at night, go home and ice down, sleep, and continue to ice and rest in bed until it was time to go to teach class the following day. Combine that with the financial challenges I was facing, and you can guess that I wasn’t the most pleasant person to be around. It didn’t take long to see my retention numbers start to drop considerably. And, I soon realized that I needed to do something drastic, and fast, or I was going to lose my school. The first thing I did was to make a conscious decision to be happy and upbeat at the school each day, regardless of how I was feeling. It didn’t matter how bad I felt, when I pulled into that parking lot I pasted a smile on my face and kept it there until I left late at night. And, I started focusing on making my students feel like rock stars, in every single class. My perceived pain levels decreased. My school started to grow, despite the effects of the recession. Granted, I changed some other things too, like switching to a low-inflammation diet, and I started focusing all my marketing efforts on internet marketing, because it was all I could afford to do at the time. Still, I don’t think I would have made those changes if I hadn’t first changed my attitude, because changing my attitude allowed me to recognize opportunities, where once all I saw were challenges. So, the moral of the story is that your attitude matters. Start focusing on the good things in your life, take care of the good people in your life, and focus your attention away from yourself, and toward showing kindness to others. Once you learn to do these things, you’ll soon find that things are turning around for you… or, maybe things were already damned good, and you just didn’t realize it. P.S. – *That’s not to say that you don’t need to seek help if you are depressed. Much of what happens in therapy is that a person with poor coping mechanisms and ingrained, harmful thought patterns learns how to change those patterns and adopt better coping mechanisms. So, in a sense therapy is the process of retraining the brain. P.S.S. – **When I say, “Happiness is a choice,” I am assuming we’re discussing healthy individuals. Obviously, in cases of neurochemical imbalance or disease processes that cause said imbalances, an individual may not be able to “choose” to change their thought processes. In these cases, medical intervention is necessary. But for the average healthy person, you can definitely train your brain to “choose” to be happy. It’s great to see an article about this issue. Many teachers don’t and probably don’t like to talk about it. Yeah, martial artists kind of have this attitude that showing any kind of weakness is taboo. But, everyone needs help at some point in their life, and we’re no different in that regard. Hopefully this article will help people realize they’re not alone. I am tired of hearing about martial artists committing suicide. Michael, This is a great article and much needed in our industry.